So many customers come into Universal Tile working to create a luxurious bathroom. Typically, they do this by visiting the stone room to pick out a plethora of marble. However, usually what this consumer doesn’t realize, is the maintenance involved with having a bathroom adorned in marble. 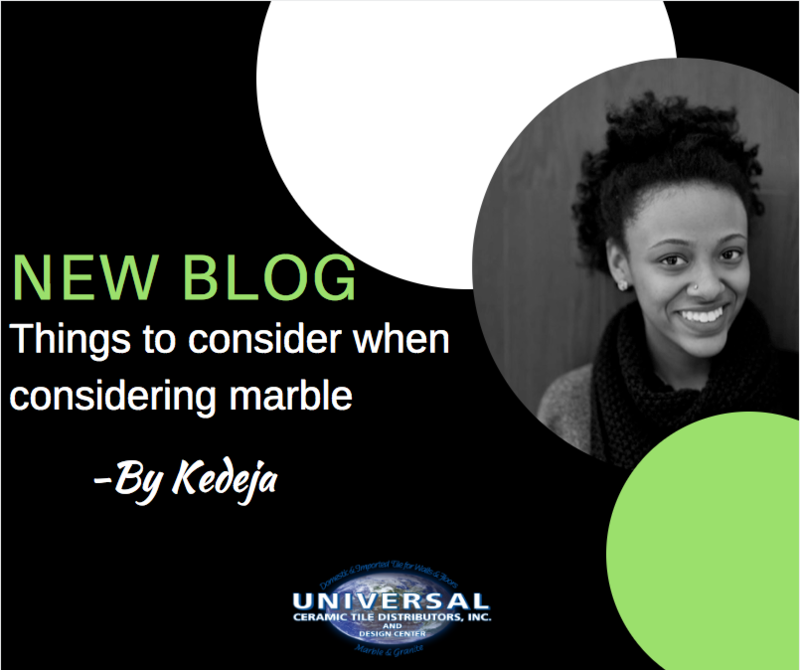 These are some maintenance tips to keep in mind before buying marble. Not only does marble stain easily, it also scratches and etches easily. This particular stone is sensitive to the acidic value of certain foods as well such as citrus, soda products, and lemon juice. This is because marble contains calcium carbonate which dissolves in acid. Repairing these etches includes copious amounts of sanding, which can very be time consuming. Any natural stone, like marble, needs to be sealed at least once a year. If you install a natural stone like marble, for instance, without sealing it, it could stain because it’s a very porous stone. It’s also the softest of all natural stone. And once it is stained, it’s going to stay that way and there’s nothing that you can do to return the marble to its former state. We are proud to have one of the largest retail tile and stone selections in Connecticut and throughout New England. If you had your heart set on Marble, but realize that you cannot keep up with the maintenance (or don’t want the responsibility, especially in a busy, active household), We have great porcelain options that prove to be just as beautiful and stunning, without the hassle and maintenance involved! If you have questions regarding what type of tile is best for your project, come on down to Universal Tile on Murphy Road in Hartford Connecticut! Don’t hesitate to ask for me and I can help with everything from choice to design! At Universal Tile, you can be assured that you will not only find the stone or tile you’ve been looking for, but also have a great design team to help make your vision a reality. We are here, ready and waiting for your questions and projects.